NASA astronaut Reid Wiseman shared this photo of the volcanoes Mount Etna and Mount Stromboli on Aug. 14, 2014. Two astronauts aboard the International Space Station have captured a one-two punch of incredible views from space of Mount Etna and another active volcano in Italy spewing steam and lava. 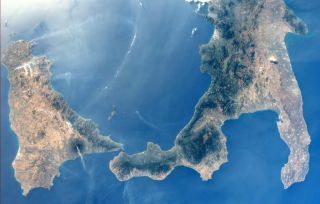 NASA astronaut Reid Wiseman and European Space Agency astronaut Alexander Gerst managed to photograph both Mount Etna and Mount Stromboli from their positions on the space station earlier this month. Gerst caught sight of the two Italian volcanoes and their lava flows at night, while Wiseman captured the mountains during daylight. "You can see the red glowing lava of 2 volcanoes on this photo!" Gerst wrote when he posted his photo on Twitter (@Astro_Alex). "Spot them on @astro_reid's day photo!" European astronaut Alexander Gerst uploaded this photo of two volcanoes, Mount Etna and Mount Stromboli, by night on Aug. 1, 2014. "#Etna and #Stromboli erupting by day," Wiseman wrote in his Twitter (@Astro_Reid) post. "@astro_alex took the exact same shot at night, with lava. #teamwork." Gerst has quite a bit of experience with volcanoes. Before flying to space, he was awarded his doctorate for research he did investigating volcanic eruptions and active volcanoes. While working toward his master's degree, Gerst also developed new techniques that could help scientistsbetter predict when volcanoes might erupt, according to ESA. Mount Etna was actually the first erupting volcano Gerst climbed, according to a Twitter post sent out in July. Mount Etna is the largest volcano in Europe, standing at 10,900 feet (3,328 meters) high. It is one of the most active volcanoes in the world, but it hasn't had a major eruption since 1992. The active volcano is almost always discharging gas, ash or lava. This isn't the first time Mount Etna's active phase has been seen from space. NASA astronaut Karen Nyberg caught sight of the volcano from her post aboard the international Space Station in October 2013. That same year, Canadian astronaut Chris Hatfield also snapped an amazing image of the active volcano's ash floating through clouds and out to sea. Both Gerst and Wiseman are about halfway through with their first spaceflight. They launched to the space station in May and are expected to return to Earth in November. Wiseman and Gerst are joined on the station by NASA astronaut Steve Swanson and three cosmonauts: Maxim Suraev, Oleg Artemyev and Alexander Skvortsov.